By Deron Wagner|actual past stock & ETF trades, trading education articles|Be the first to comment! 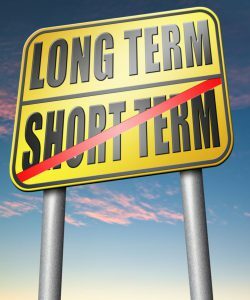 Many new and experienced swing traders make the mistake of focusing only on short-term daily charts when scanning for new trading opportunities. While daily charts are great for locating low-risk entry points, the limited price history is not very useful when narrowing down a list of potential buy candidates. This is where long-term monthly stock charts shine by offering massive insight in just a quick glance — without adding too much time to the scanning process. In this article, you will learn a few simple rules to easily find monthly chart patterns that often lead to powerful rallies of 50% to 100% or more in as little as three to six months. Continue reading to discover how to predict explosive breakouts with monthly stock charts, and with three examples of real trades that led to huge gains in a short period. Monthly stock charts are a thing of beauty when they show a pattern that is three to five years in the making — such as a breakout to new-all time highs, or the first base to emerge after the break of a long-term downtrend line. When using monthly stock charts, we focus on finding stocks breaking out to new all-time highs for the first time in two to five years — the sweet spot, especially for stocks that have IPO’d within the last 10 years. Following are a few examples of monthly stock charts that broke out to new all-time highs last year. Each stock below was an actual trade presented to subscribers in The Wagner Daily, our nightly swing trading newsletter. 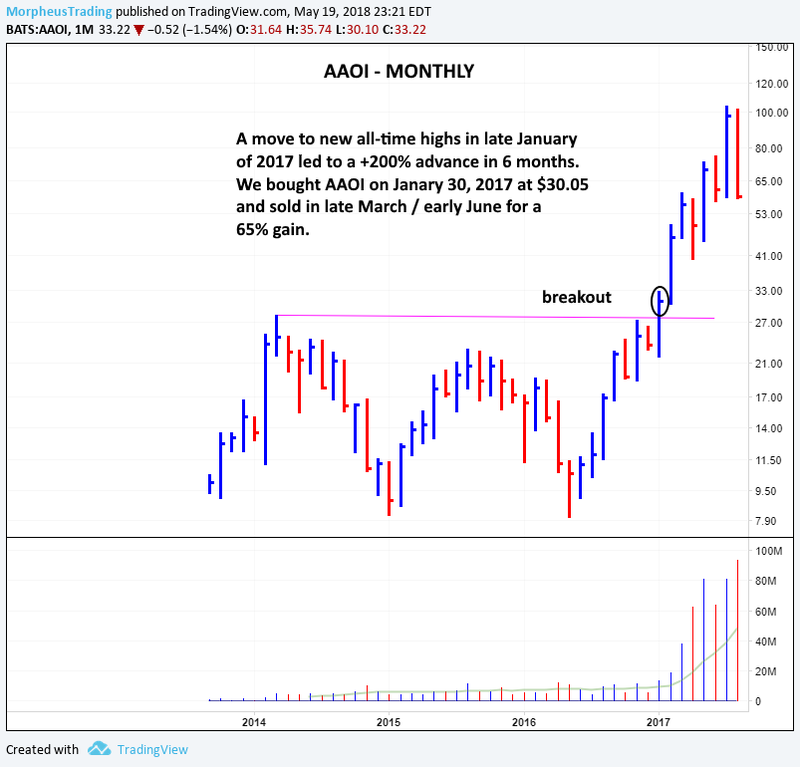 Applied Optoelectronics ($AAOI) broke out to new all-time highs via a breakaway gap in January 2017 on strong volume, a sure sign of institutional accumulation. The massive breakout followed three years of chop in the $8-$27 range and led to a 200% advance over a 6-month period. However, the “easy” money was made during the first three months, prior to a nasty shakeout in month four of the breakout. 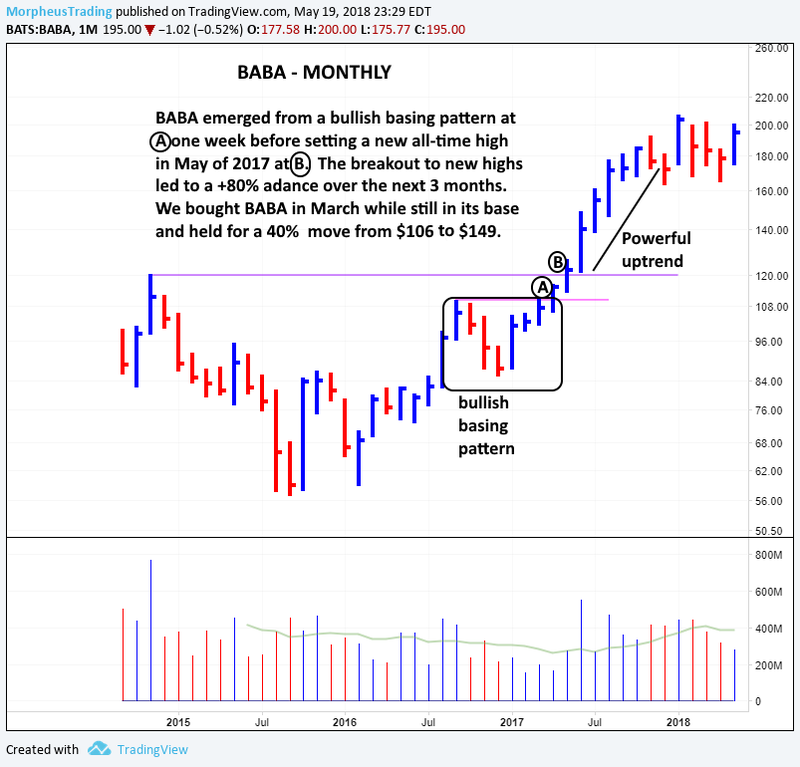 Starting in September of 2016, Alibaba ($BABA) began forming a bullish base on its monthly stock chart, just below its all-time high from 2014. After building the base for six months, $BABA broke out to a new all-time less than two months later. Alibaba zoomed from $120 to $200 after the breakout, thanks to a complete lack of resistance at new all-time highs. It’s important to remember that you are not ONLY looking for stocks breaking out to new all-time highs. The best monthly chart breakouts are typically preceded by solid bases of support that are already within striking distance of their record highs. 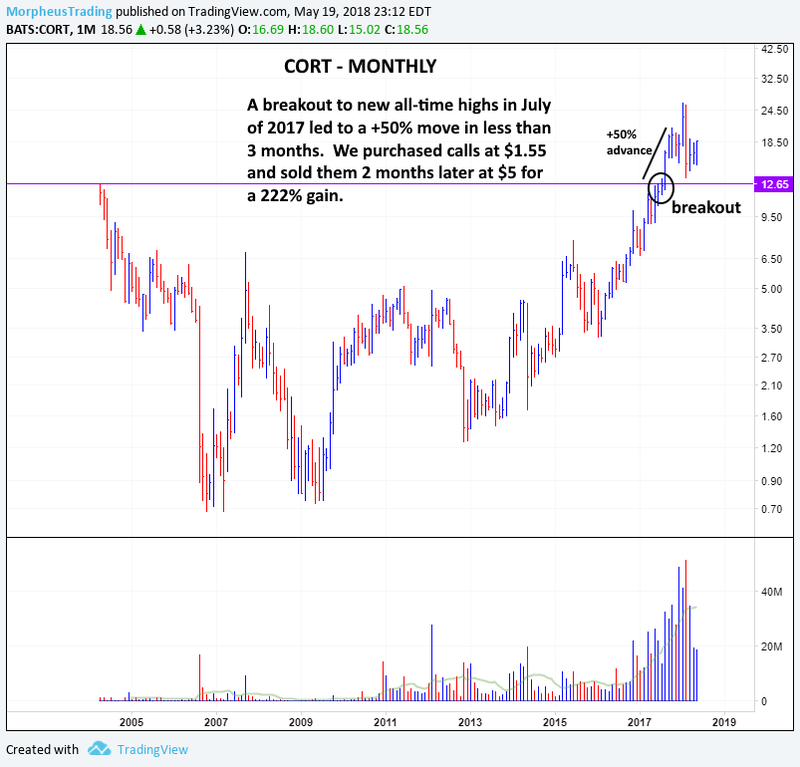 When $CORT blasted off from its breakout, the stock cruised 50% higher in less than 3 months. Rather than buying the actual stock, we bought $CORT call options at $1.55 after the breakout. Obviously, no trading system, chart pattern, or technical indicator works 100% of the time. Accordingly, not all stocks that rally to new highs zoom 50% to 100% or more in six months. Nevertheless, monthly stock charts do a fantastic job of helping you find stocks with the most explosive potential. Start producing above average gains over a short period by regularly scanning the monthly charts and buying stocks that fit the basic criteria above. Sign up now for your Wagner Daily subscription and we’ll do your “heavy lifting” to find and alert you to the best breakout setups every day.